The old adage “slow and steady wins the race” might be very apt for how banks have approached P2P payments. 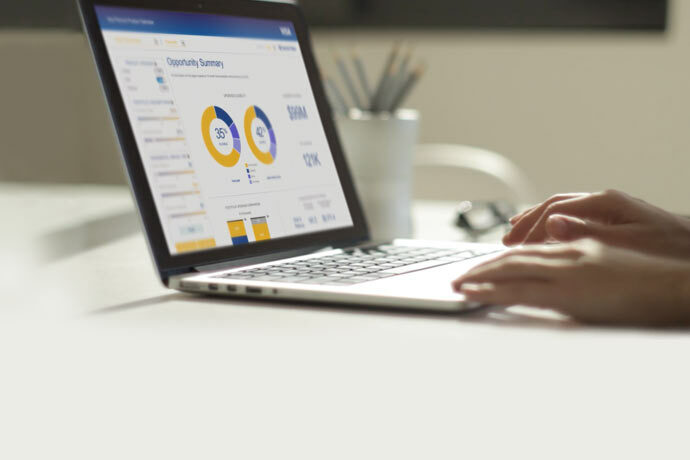 While Millennials were flocking to Venmo and the Cash App to split restaurant bills and pay one another back for other purchases, FIs were locked in their walled gardens, often limited to allowing P2P transfers within their own networks. But that began to change last year with the launch of Zelle. Owned by a joint venture of many of the biggest FIs (including Bank of America, JPMorgan Chase and Wells Fargo), Zelle is more than a standalone app (although they have that, too). 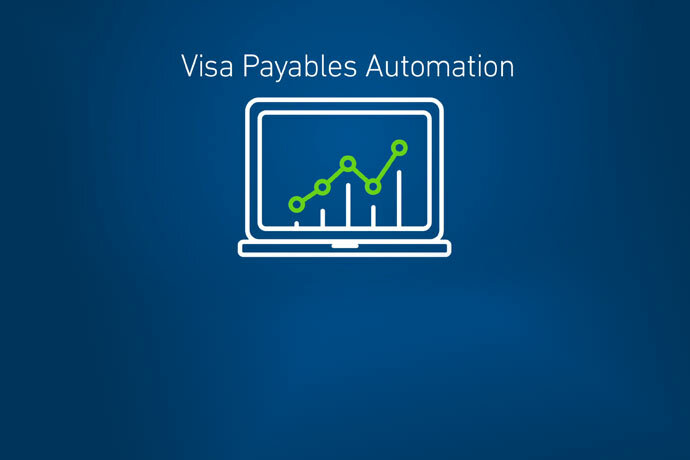 It’s a payment network that is integrated into existing bank apps allowing for simple (and no fee) money transfers. 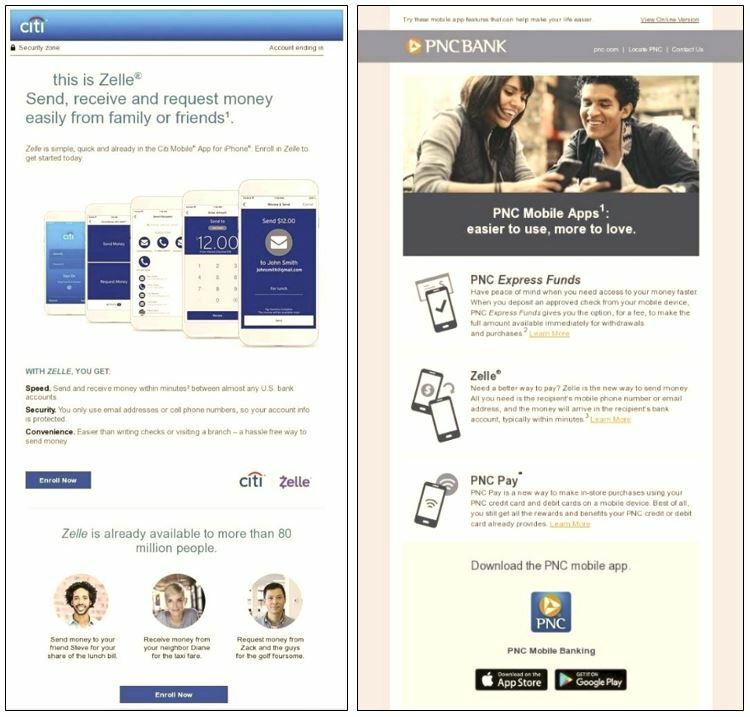 The banks have actually spent many years supporting the development of this network, but it’s only recently, with the new brand name Zelle in place, that they have made a major push to integrate and promote it. So how is that working out? In September of 2017, CNN reported that Zelle was already available through some banks and a standalone app, but they noted that Zelle “has some serious competition…Venmo is already highly popular among Millennials, boasting $17.6 billion in mobile transactions last year.” Just a few months later, in January of 2018, Zelle announced that it had signed up over 60 banks and transferred $75 billion in 2017 (a 36% increase from the prior year). 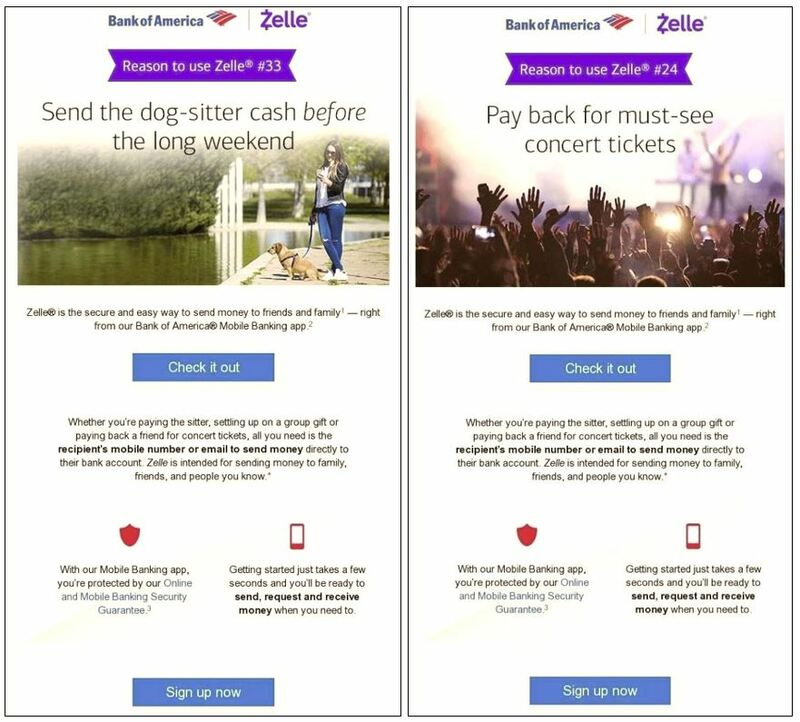 And they were just starting a mass marketing campaign targeting a much wider audience than Millenials: Zelle was looking to reach all digital banking users. The national push lead with a humorous 60-second spot starring Zelle’s new spokesman, Daveed Diggs of Hamilton fame. And so, they did. The marketing began to pick up at the start of this year, and by late January, Zelle claimed to be adding an average of 100,000 consumers a day. 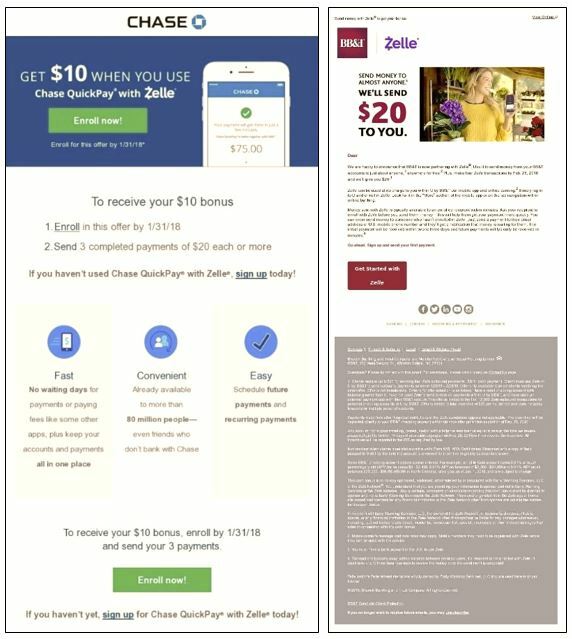 Based on Mintel’s capture* of emails and direct mail promoting Zelle, leading FIs were deploying awareness campaigns at the same time utilizing a variety of approaches. Citi and PNC lead by promoting their existing apps. Chase and BB&T included incentive offers. But did all of this flashy above-the-line and hardworking below-the-line marketing work? Yes. At the end of April, Zelle announced that more than $25 billion moved through its network in Q1 2018 (an increase of 15% from Q1 2017) on 85 million transactions. Over a third of those transactions (29 million) were through Bank of America, which saw $9 billion in volume. Although more than 100 financial institutions are now partnering with Zelle, FI awareness is still ongoing, and so we are sure to see additional growth this year. Consumers likely have different expectations for risk and security from their banks versus “start-ups” like Venmo. As a result, all of this promotion may need to come with some customer education, especially for those who are new to this method of payment. Still, with P2P payments growing and a big segment of the marketing still untapped, Zelle is a way for banks to show all consumers (including Millennials) that they can keep up with the times, slowly and steadily. When it comes to current messaging, most FIs promote Alexa skills and proprietary chatbots as convenient ways to access basic account information and conduct simple transactions, but in the future we’re likely to see greater emphasis on customer relationships and consumer engagement.